ROSEAU, Dominica, Dec 4 2017 (IPS) - McCarthy Marie has been living in the Fond Cani community, a few kilometres east of the Dominica capital Roseau, for 38 years. The 68-year-old economist moved to the area in 1979 following the decimation of the island by Hurricane David. But even though David was such a destructive hurricane, Marie told IPS that when Hurricane Maria hit the island in September, islanders witnessed something they had never seen before. Hurricane Maria, a category five storm with sustained winds reaching 180 miles an hour, battered the Caribbean nation for several hours between Sep. 18-19. It left 27 people dead and as many missing, and nearly 90 percent of the structures on the island damaged or destroyed. Marie said Dominicans have been talking a lot about climate change for quite some time, but the island was not fully prepared for its impacts. And while Dominicans in general have not been building with monster hurricanes like Maria in mind, Marie said he took an extraordinary step following his experience with Hurricane David. “I prepared for hurricanes by building my hurricane bunker in 1989 when I built my house. When the storm [Maria] started to get serious, we went into the bunker and we stayed there for the duration of the storm,” he said. “I have been seeing more and more buildings going up that have concrete roofs but it’s not the standard by far. The usual standard is a house made of concrete and steel with a timber roof. So, most of the houses, the damage they suffered was that the timber roof got taken off and then water got inside the house and damaged all their stuff. “We need to build houses that can withstand the wind, but the wind is not so much of a big problem. Our big problem is dealing with the amount of water and flooding that we are going to have,” Marie explained. Like Marie, Bernard Wiltshire, who is a former attorney general here, believes Dominica is big on talk about climate change but the rhetoric does not translate into tangible action on building resilience. He cited the level of devastation in several countries in the Caribbean over the last hurricane season. “We certainly did not act fast enough in Dominica, we know that. And from looking at what happened in Puerto Rico and in Antigua and Barbuda, I didn’t see any evidence that we have really come to grips with what is required to make us more resilient in the face of those conditions that are going to confront us,” Wiltshire said. Dominica acts as a microcosm of the climate change threat to the world, and the island’s prime minister, Roosevelt Skerrit, has called for millions of dollars of assistance so the country can build the world’s first climate-resilient nation. “How many of the countries that continue to pollute the planet had to suffer a loss of 224 percent of their GDP this year?” asked Skerrit. “We have been put on the front line by others. We were the guardians of nature, 60 percent of Dominica is covered by protected rain forests and has been so long before climate change,” he said. The island’s Gross Domestic Product has been decimated, wiped out due to severe damage to the agriculture, tourism and housing sectors. It is the second consecutive year that all 72,000 people living on Dominica have been affected by disasters. Skerrit is convinced that the only way to reduce the number of people affected by future severe weather is to build back better to a standard that can withstand the rainfall, wind intensity and degree of storm surge which they can now expect from tropical storms in the age of climate change. 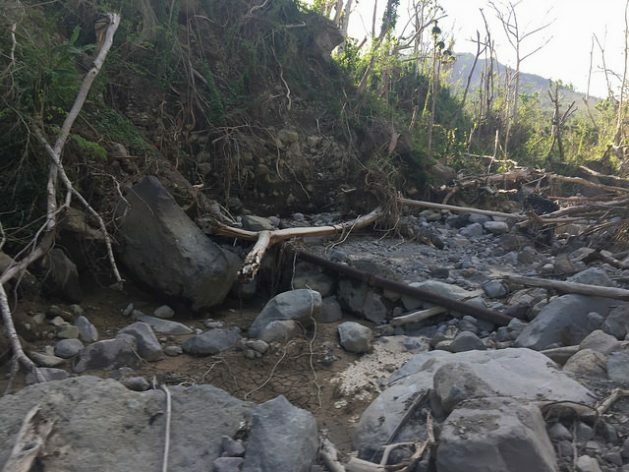 As Dominica seeks to become the world’s first climate-resilient nation, Skerrit said they cannot do this alone and need international cooperation. But Wiltshire said Caribbean countries must shoulder some of the blame for climate change. “I don’t want us in the Caribbean simply to point fingers at the bigger countries and completely ignore our own role. There is a problem I think, in our islands, if not causing climate change, in contributing to the degree of damage that is actually done, the severity of these disasters,” Wiltshire said. “In Dominica for example, one of the most obvious things was the deluge of debris from the hillsides, from the interior of the country, carried by the rivers down to the coast. It is up there where we have unplanned use of the land, building of roads, the construction of houses without a proper planning regime. So, we ourselves have a role to play in this where for example we are giving away our wetlands and draining them for hotel construction,” he added. Head of the Caribbean Climate Group Professor Michael Taylor said climate change is happening now and Caribbean residents no longer have the luxury to see it as an isolated event or a future threat. “I think the first thing that we have to think about is how in the Caribbean are we really perceiving climate change and not necessarily only at the government level but at the individual level, at the community level,” he said. “Do we perceive climate change as something that is an event or are we beginning to recognise that climate change for us in the Caribbean is a developmental issue? We have to begin to see that climate change is interwoven into every aspect of our lives and it impacts us daily. It’s where you get your water from, the quality of your roads. Until we begin to realise that climate change is interwoven into life then we will always be almost with our foot on the backburner, always trying to catch up. “We do have resource constraints within the region, we do have other pressing issues which sometimes tend to cloud over both at the community level going right up to the government level, but I think climate has put itself on the forefront of the agenda and that said, we need now to mainstream climate into the very short-term planning and at all levels of community going right up through government and even regional entities,” Taylor added.